Updated at 2:30 a.m. E.S.T. You would think artists would learn from Bobby Shmurda's mistakes. Tekashi alongside his former manager kifano 'Shottie' Jordan, and their associates Faheem Walter (aka Crippy), Jensel Butler (aka Ish), Jamel Jones (aka Mel Murda) and Fuguan Lovick (aka Fu Banga) are facing some serious prison time. 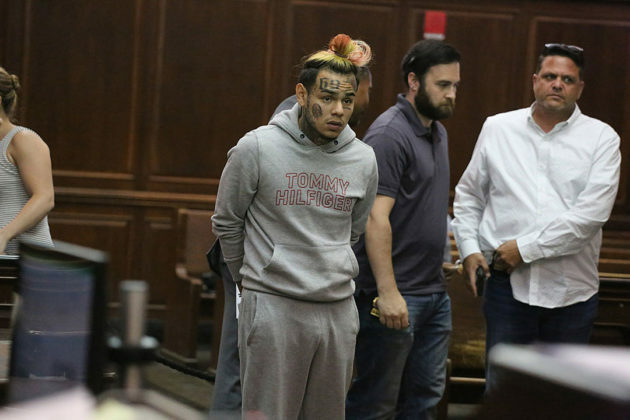 According to a press statement from the United States Department Of Justice, Daniel Hernandez also known as Tekashi and his affiliates are a member of The Nine Trey Gangsta Bloods - a gang notorious for drug deals, armed robberies and shootings around Brooklyn. According to the 17-page indictment, 6ix9ine and his gang distributed drugs including heroin, fentanyl, Furanyl Fentanyl, MDMA, Dibutylone and marijuana. The feds also believe Tekashi and his crew were involved in a July shooting in Bed-Stuy, which left an innocent bystander shot. Two of the charges 6ix9ine is facing carries a maximum sentence of life in prison. His ex-manager, Shottie also faces the same 6 counts as the Fefe rapper. The 20-year old multi-colored rapper was denied bail and will remain in custody until his pending trial. The full indictment can be viewed here. Previous Story published on Monday, Nov. 19. Tekashi 6ix9ine was reportedly arrested on Sunday night (Nov. 18) by ATF agents in New York City for racketeering and firearms. According to TMZ, the arrest stems from a joint investigation conducted by the ATF, New York Police Department and Homeland security. His ex-manager, Shottie, who he recently fired, Faheem Walter, also known as Crippy and one other suspect were also taken into custody. All four are facing racketeering and firearam charges, which in 6ix9ine's case almost "certainty" means he's going to prison. The news comes a day after the "Fefe" rapper revealed the tracklist for his upcoming debut album Dummy Boy. Due November 23 "Dummy Boy" will feature appearances from Kanye West, Nicki Minaj, Lil Baby, Tory Lanez, Bobby Shmurda and more.